Sammy's Halal Food can provide catering services for those seeking the absolute best in halal food for their event. We are without a doubt, the #1 provider of halal food catering services in terms of quality, and service. Your guests will be absolutely stunned with how incredible the food is when you choose Sammy's Halal Food to cater to your event. We have catered all types of functions, including corporate and social events, parties, get-togethers, and we are fully equipped to deliver the food to your premises. We guarantee that catering orders prepared by Sammy's Halal uphold the same quality standards that we always maintain. 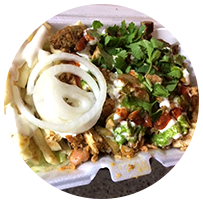 Sammy's Halal will customize a catering menu to fit your needs. We offer competitive pricing and work one-on-one with our catering clients to make sure our catering services reflects their personal style for their event. Contact us today for more information on having Sammy's Halal cater your next event. SPECIAL OFFER: Catering orders for 100 people get food for 10 absolutely FREE!